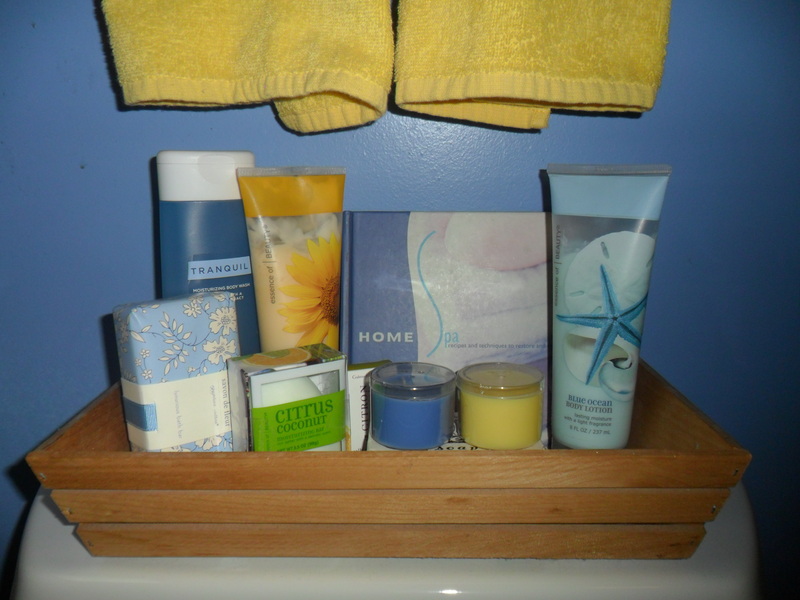 In my bathroom, I have a basket that I keep extra soaps, lotions, and candles in that can either replenish our stock or be used by guests when they visit. 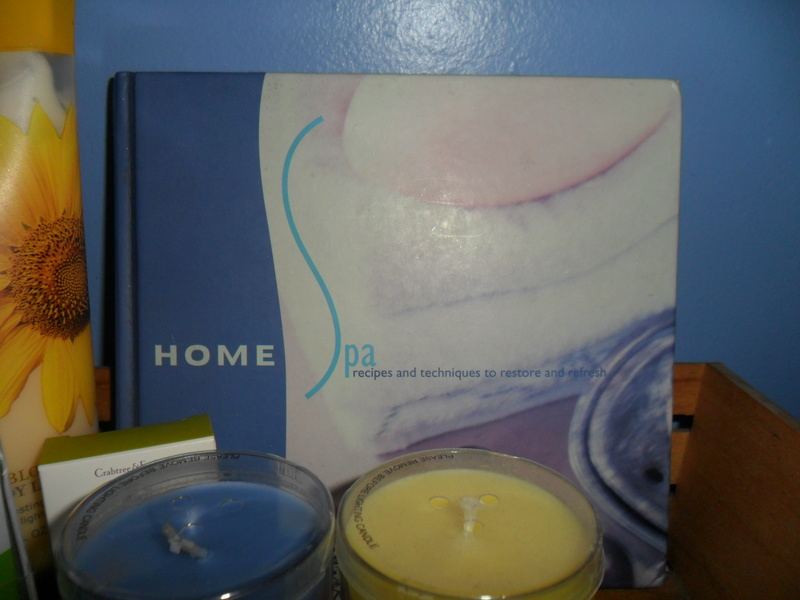 I also have a copy of a Home Spa book that my sister gave me for Christmas way back in 1998! If you read my blog regularly, you will know that my family always signs books that we give as gifts and this one is signed from her, her husband, and my nephew who at the time was only 6 months — now he is almost 14 years old! 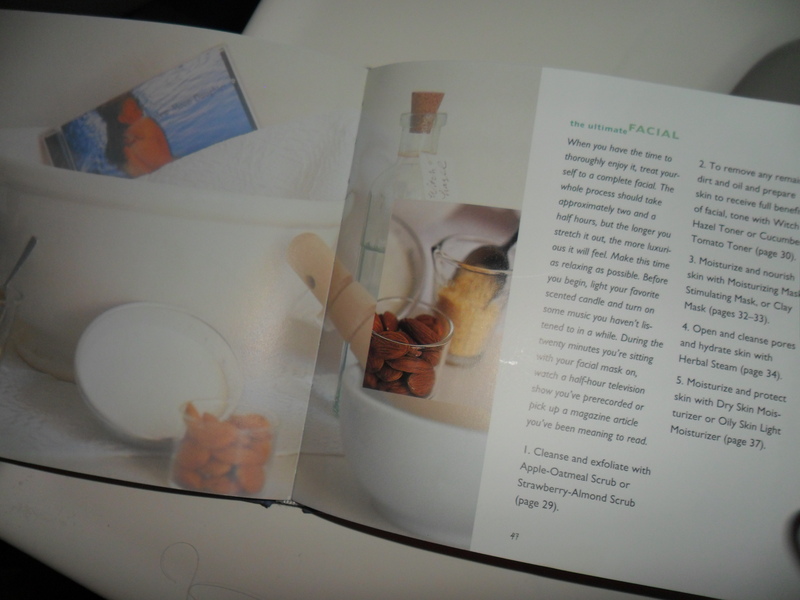 Home Spa: Recipes and Techniques to Restore and Refresh is a great little book with recipes on how to turn your own home into a luxury spa. Will you use this book everyday? No! But it is fun to try as a weekend event, for a girls’ day or a bridal shower. There are sections for hair, face, eyes, hands and nails, feet, and body. Each section has a few different recipes for products you can make and use. Strawberry-Almond Face Scrub, Herbal Steam, Cucumber Toner, Buttermilk Soak, Beach Sand Foot Scrub, and Relaxing Massage Oil just to name a few. Each recipe lists the amounts of each ingredient you will need, plus step by step instructions on how to make your dream homemade spa product. 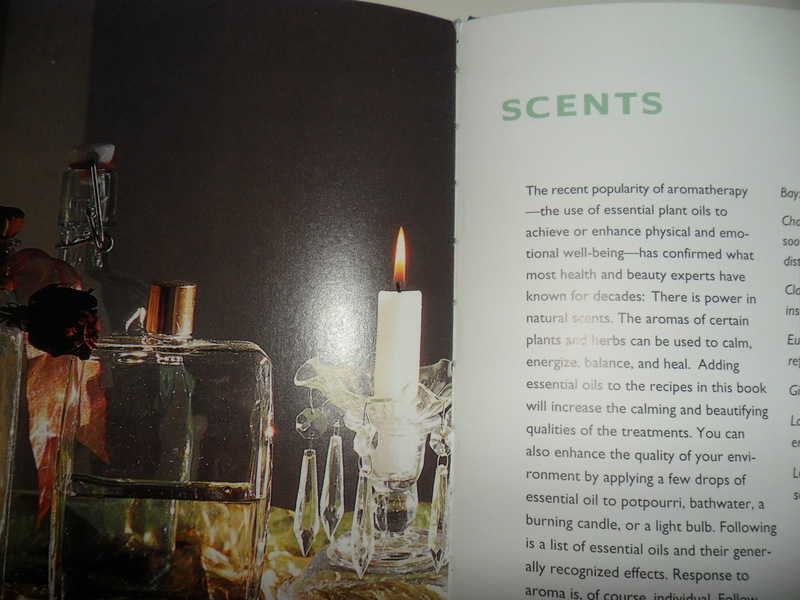 All the different types of essential oils are defined in the Scents section. Certain types of aromatherapy are used to achieve different results. Some scents calm while others energize. Did you know that chamomile relaxes, eucalyptus refreshes, lemon sharpens the senses and nutmeg invigorates? Reading this section first helps you decide what type of spa experience you are looking for, then you can choose the recipes that will enhance the experience the most. 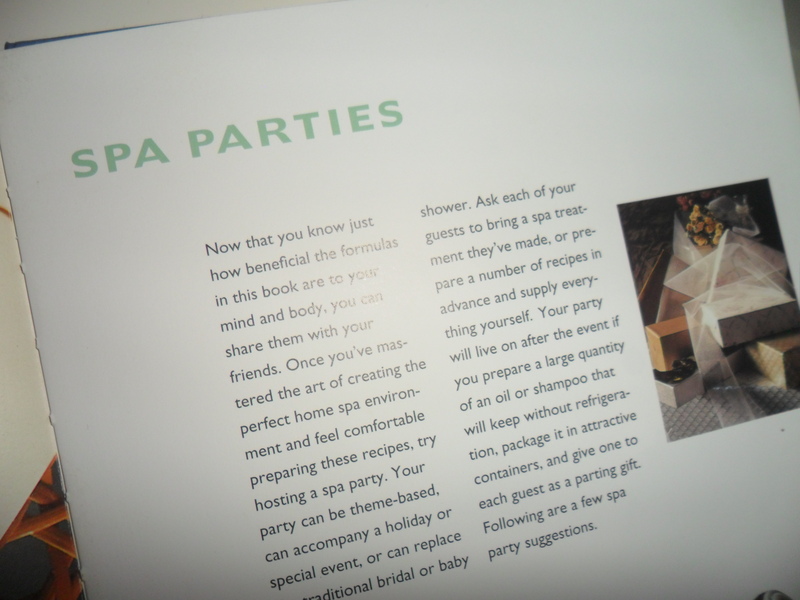 There is also a detailed section about hosting a spa party. Rites of Spring, Christmas, and a Bridal Shower are the three types they suggest along with what recipes should be used with each. Invitations can include instructions to bring a robe, flip flops, and a favorite nail polish. I hosted two parties using this book; one was for a friend’s birthday party, the other was a bridal shower for my soon-to-be sister-in-law. I put out lots of candles, face cloths, fresh flowers, magazines, and pitchers of drinking water. The kitchen was turned into a herbal steam room for a facial. The living room was perfect for manicures and pedicures. Each bedroom was a relaxing oasis, inviting you to lie on the beds with either a facial or eye mask. Don’t forget to put soothing music on and turn off the TVs! This is also a great book to give as a gift. Pair it with your favorite lotion, nail polish, mini-manicure set or even a candle and you have a great present. Have you ever hosted or gone to a spa party? What was it like? Tell me all about it!